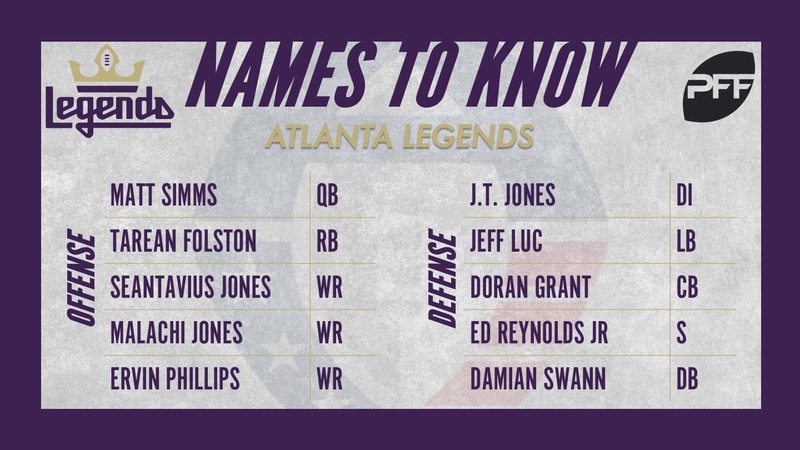 We continue the list today with the Atlanta Legends, head coached by Kevin Coyle. While his last regular season snaps came back in 2014 with the New York Jets, Simms earned the starting signal-caller spot for the Legends in their opener against Orlando on the heels of a career that spans 582 additional NFL preseason snaps. He didn’t fare the best in his scrimmage debut for the Legends earlier this year but his veteran presence and leadership skills saw him selected as one of the team’s captains as they approach opening night. Folston leads the charge out of the backfield, and a talented backfield at that. He’s more than two years removed from his last extensive action in 2016 with Notre Dame but that season saw him gain nearly 60% of his yards after contact and break 11 tackles on just 77 carries. His running style should complement the out-of-the-backfield ability of the other running backs mentioned here. At 6-foot-4, 216 pounds, Seantavius makes up one half of the ‘Jones Bros’ at receiver for the Legends. Opposite Malachi Jones, Seantavius has spent the last five preseasons in an NFL camp and hauled in 15 receptions in the process. If he can become a more reliable target, his stature should pay big dividends for Simms on key situations as nine of his 15 receptions in the preseason have moved the chains or scored a touchdown. The other half of the ‘Jones Bros,’ Malachi has shined bright outside of PFF grades and in the Arena Football League but his numbers back from our grades in 2014-15 and his time at App State are still strong. He’s been selected as one of three starting receivers for Atlanta and it’s clear to see why. During those 2014 and 2015 seasons at App State, he averaged 16.3 and 17.9 yards per reception, respectively, and was a real threat after the catch, gaining an average of 5.2 YAC/reception over those two years. Never really given a shot at the NFL level after just 76 snaps this past preseason, Phillips heads to Atlanta after hauling in 89 receptions in 2016 and 90 receptions in 2017 for Syracuse. He feasted in the slot and should do the same in the AAF. In 2017 alone, he hauled in 84 receptions from the slot to rank second nationally. Although he never got his crack at the regular season in the NFL, Jones heads to the Legends after spending the last two preseasons with the Falcons and logging 322 snaps in the process. His career at Miami (Oh.) saw him rack up 113 total QB pressures on 1,125 pass-rushing snaps from 2014-2016. He was a sure tackler as well, missing just 10 of his 127 total attempts in that same span. Talk about experience, Luc revitalized a career that had seemingly gone sour while at Florida State when he transferred to Cincinnati for the 2014 season. He flashed his potential with an elite pass-rushing grade on just 104 snaps while still possessing solid all-around skills on defense. Perhaps he can revitalize his career yet again at only 26 years old after he attempted a position switch with the Cincinnati Bengals during the 2016 NFL preseason that saw him play just 19 snaps as a tight end. His extensive professional action at linebacker came from his stint with the Miami Dolphins in 2015 when he graded out with a 79.7 overall grade from 80 preseason snaps. Somehow, Grant is still only 26 years old. He finished his time at Ohio State in 2014 with an 80.2 overall grade accompanying five interceptions and five pass breakups on 83 targets. He was never quite able to stick with either of the three NFL teams he landed on over the past four preseasons, however, in his extensive time with the Chicago Bears most recently, he finished as the preseason’s fifth highest-graded cornerback with a 90.4 overall grade on 206 snaps as he allowed just a paltry 7.3 passer rating when targeted across 16 targeted passes. Reynolds has a regular season NFL interception to his name, something he pulled off despite seeing just three targeted passes in 2015 with the Philadelphia Eagles. Still, he’s a thundering tackler at 6-foot-1, 206 pounds and has produced some shining moments in coverage during the NFL preseason. He adds a dimension against the run as well but should not be looked over in coverage. Similarly to Grant, Swann is still only 26 years old and had quite the impressive college record following him. His final season at Georgia saw him finish with an elite, and impressive, 92.1 overall grade. In fact, he finished the 2014 season as the nation’s third highest-graded cornerback behind only Senquez Golson and Vernon Hargreaves. He has since played in 250 snaps across the NFL’s preseason but hasn’t seen the field since 2017. If he can re-ignite the level of play that he had in 2014 with Georgia, the Legends would sport a more-than-capable extra defensive back in their secondary.